The feature that i have abandoned FF for Opera is now missing. Anyone knows how to restore it on 50? Do you mean + button on the Bookmarks bar? @zalex108 No, when you go on the bookmark tree you had a option to add the bookmark to a specific folder. Now i have to drag it there and it is stupid! Maybe is what you are looking for. @zalex108 Yeah, bud did you try it with 50? there is no more add bookmark here. @user2018 Having the exact same problem. No way to add bookmarks to folders on my bookmarks bar. 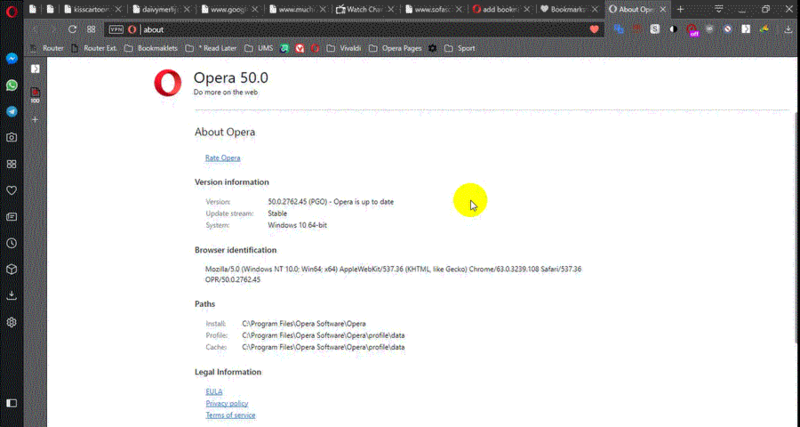 Just installed Opera 50. If you grab the tab for the page you want BMed and place it over the folder you want it in, you have the choice of where you want to place it as the folder tab dropped down to display all the BMs in it. In previous versions, if you added the BM to a folder on the BMBar, it was placed at the END of that list in the folder, and then you had to go back into the folder and move it where you wanted it. For me the current method is better. Either grab the tab of the page you are viewing and drag it to the place on the BMBar where you want it, or right click on the BMBar where a drop down will include "Add Site"
It works here on Bookmarks and Bookmarks Bar. I really don't like this decision to remove "+ add bookmark" in both bar and folders. I don't care about drag&drop or right click menu options. It is good to have more possibilities and users should decide which one they'll use. @bbildman Guys i can understand adding new stuff but why remove the old one ? And then you need to go to a forum to find out how? Everyone is trying to copy Apple who are doing what they want without asking !!!! Plain stupid if you ask me!!!! You just have to "Right click". Also, "+" button gave some problems, don't know if it's related. I am not seeing this new way? Developers of the Opera, add this button back! This button is convenient and very useful. Damn! Now I do not know how to add a bookmark. And in Opera 49 it was so simple. First off, you should know I have many folder tabs on my Bookmark Bar, I placed the folders I use the most right on the BMBar, so when I click them I get a drop down box that includes all the BMs within that folder. SO when I want to BM a page, I will grab the tab of the page I want to BM and hover it over one of the folders (on the BMBar), this then will open that folder drop down box, and I can then plave the new BM anywhere in that folder. Very good idea! Looks easy and comfortable. Since OBlink lacks of a scroll bar or an advanced Bookmarks add menu as O12, this is the most practical way.